Monday August 1st 11:00 AM-12:00 PM Drop in craft. Make a Summer Olympics Craft. In the Children's Activity Room. Tuesday August 2nd 5:30 PM - 6:30 PM Drop in Coloring Time in the Children's Activity Room. Wednesday August 3rd 11:00 AM Story Hour and Watermelon Craft in Children's Activity Room. Monday August 8th 11:00 AM End of Summer Program. Music with Nancy Sweeney followed by Ice Cream Party. Reading Logs are Due August 4th ! This year children can also track their reading online with Wandoo Reader ! 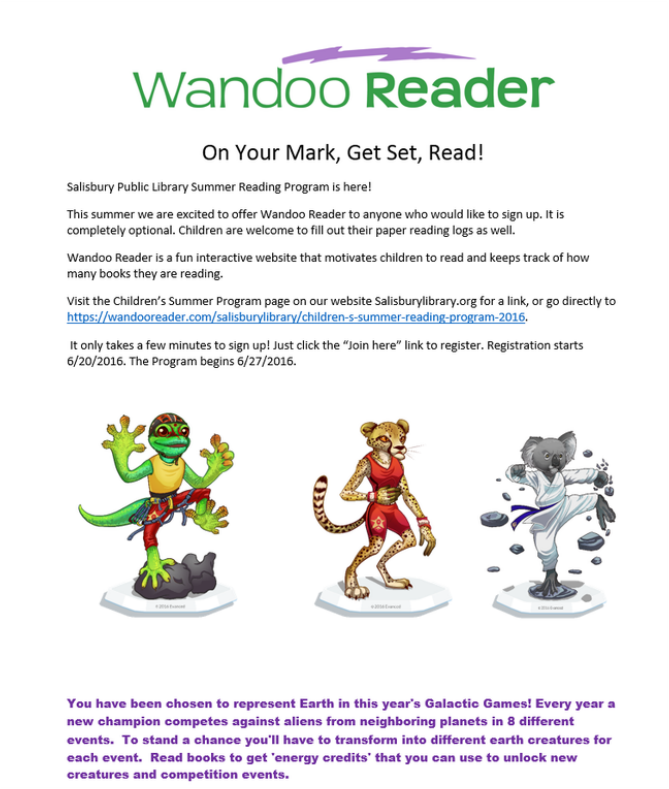 Register online starting June 20th by visiting https://wandooreader.com/salisburylibrary/children-s-summer-reading-program-2016. ​The program will begin on June 27th. ​We recently started a Minecraft club in the library. We are playing Minecraft on a server together using updated Minecraft Pocket Edition or Minecraft for Windows 10. We are able to accommodate 12 children in each group and our first group is currently full. If you have a child who plays Minecraft Pocket Edition or plays Minecraft on a laptop with Windows 10 and would like to add them to our waiting list call/ email/ or visit Kristen at the reference desk. 978-465-5071 x201 or Kpacker@salisburylibrary.org.